Push up bars are an essential part of home fitness equipment. The best pushup bars add intensity to home workouts to build lean muscle. In our opinion, the best bars on the market are TKO Extreme Training Bars. Amazingly, the TKO Extreme Training Push Up Bars are made of plastic, which at first is surprising...however, it is thick and high quality. I weigh 185 lbs and they have always felt solid to me. I've heard from guys who weigh over 225 lbs, and they have no issue with them at all. The TKO Extreme Training Bars also are easy to breakdown for travel. Since they are space-age plastic, they are very light and easy to pack. I have NEVER had a problem with slippage or tipping. I use them on a large area rug and do 25-30 at a time. Is there a downside to these bars? Well, I think women might find the padding less than they were expecting, however, with some decent women's weight lifting gloves, I think they would be fine. 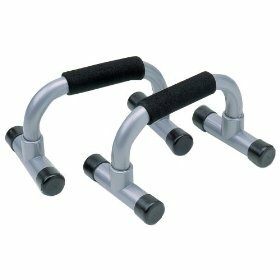 These are great for home workouts, especially if you are doing routines from Turbulence Training or the P90X Program. Listen, you will get stronger and if you are training like an athlete they will help you burn fat. However, they will NOT give you the strength to bench press 300 lbs. Let's be realistic.